Autographs 4 Alopecia: Cleveland Rocks! As a kid you dream of one day being in the big leagues. Well, if only for a day, Gavin and I got to live that dream. 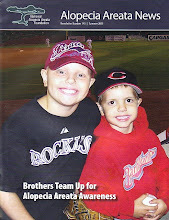 As part of the September "Team Up for Alopecia Areata" awareness we were invited by NAAF and the Cleveland Indians to be the honorary bat boys for Tuesdays game against the Tigers. What an experience! We got to the gates at a little after 4 and were escorted down on the field to watch batting practice. It was awesome! Dad, Mom, Kyle, Gavin, and I all got to stand next to the dugout to talk to the players, get autographs, and watch batting practice. I had lots of cards with me as well as a few other things to get signed. The Indians gave us a ball and we actually got a few balls during batting practice that they let us keep. Azdrubal Cabrera, Carlos Santana, Lou Marson, Jason Donald, Grady Sizemore, Koske Fukudome, Manny Acta...well, the whole team...were all as nice as could be...signed for us, talked to us, and shook our hands. The highlight of the night came when Jim Thome came over to talk to us for a few minutes. We were so excited when he got traded to Cleveland so we would have the chance to meet him. After talking to us, posing for pictures, and signing autographs, he went into the clubhouse and said he'd be right back. He came back and handed his bat to me...signed "To Blake"! WOW! A future Hall of Famer who just hit his 600th career home run just gave me one of his bats...and it wasn't even broken! Another highlight came from talking to Justin Masterson. He is one of the rising stars in baseball and took the time to talk to us for quite a few minutes. 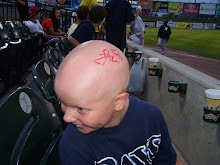 He shared with me that he had alopecia areata a few years back but forgot what it was called. Now he just shaves his head. Manager Manny Acta is a class act! He was so kind to us signing autographs, posing for pictures, and wearing the NAAF awareness band. We also got to meet 2 other pros that were there. Joe Haden, Browns cornerback, was there to throw out the first pitch, and Francisco Lindor, Indians 1st round pick, was there talking to the media. So it ended up being a great night! 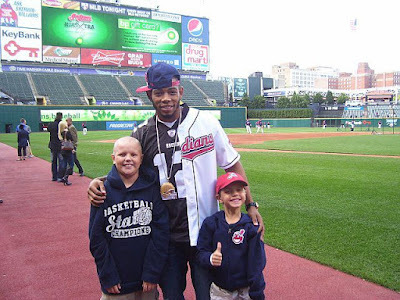 The Indians are full of not only great ball players, but great people! The greatness on the field didn't come out that night as they got beat by the Tigers 10-1 but the greatness as people shines bright and will not be forgotten. A huge "THANK YOU" to the Indians players, Indians staff, and the staff at NAAF for letting this happen! More pictures and autograph update coming Friday!